Peacefully on Friday, August 24, 2012 at the age of 89, beloved Mother, Grandma and Grandma-Grandma, passed away surrounded by all those who loved her. Left to cherish her memory are her children, Lynne Picard (Norm), Bob Barlow (Jill), Lee Coates (Ken) and Terry Barlow (Laurie). She will be greatly missed by her grandchildren and great grandchildren, Tanya Hirst, Karlee (Eric) Ryan, Danessa, Joshua and Tawneesha, Daina Krivoshea (Garry) and Mikail, D'Arcy Picard, Brandon & Mckayla, Tanner, Jessica Barlow Tracy Thor (Jason) Alex and Evan, Jodi Cox (Dallas) Darian, and Madison, Brock Coates (Shaylene), Stephen (Laura) and Shalyn Barlow. Reta was predeceased by the love of her life, Eddie Barlow in 1991, great-grandchildren, Jason Picard and Kristal Daniels, her parents and siblings. She is survived by several sisters and brothers in law. Reta was born October 29, 1922 near Roland Manitoba. Following high school in Roland, she later attended Dominion Business College in Winnipeg. Reta married George Edwin (Eddie) Barlow in 1942. They lived most of their married life in the Roland/Myrtle area and raised four children. 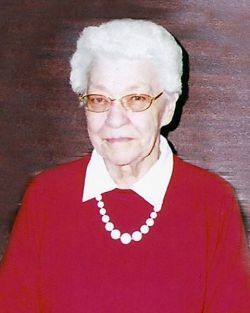 Reta was very active throughout her life within the community. These leadership roles included; C.G.I.T, cabin leader and Director for 10 years at Rock Lake camp, first president of the Myrtle Ladies Curling Club, and secretary of the Myrtle Women's Institute, Myrtle Women's Auxiliary, and the local Canadian Order of Foresters. In 1985, Reta moved to Parkview Manor in Carman after Eddie was diagnosed with Alzheimer's disease. Reta was one of the founding members of the first Alzheimer's Support Group in Winkler in 1982. She spent countless hours speaking, educating and lending support to groups throughout Southern Manitoba. She spent many years as President of the Parkview Manor Tenants Assoc. Reta loved curling, baseball, dancing, playing cards, crocheting and knitting. Reta loved to share her talents with others. In her later years, she enjoyed her sports on T.V, her visits with family and friends and looked forward to lunch with the ladies at congregate meals. We will all greatly miss her stories, her sense of humour and most of all her laughter. The family wishes to thank the many home care attendants at Parkview and the caring staff at the Carman Memorial Hospital for their compassionate and excellent care that Reta received. Much appreciation to Craig and Staff at Doyle's, for their caring guidance. Funeral service was held Monday, August 27, 2012 at 1:00 p.m. at Doyle's Funeral Chapel in Carman MB. In lieu of flowers, memorial donations may be made to Carman Memorial Hospital Palliative Care Box 610 or Boyne Lodge Box 1644, Carman MB.